In just a few days, the 2014 FIFA World Cup kicks off in Brazil. Along with the Summer Olympic Games, the World Cup has been the event I've most wanted to attend for most of my adult life. With my flight to Brazil in just a few days, its about to become a reality. My love of the world game wasn't always there though. Far from it. Growing up in small towns outside of Melbourne, Australia, you could easily be led to believe that the only sports that existed in the world were cricket and Australian rules football. Football, (or soccer as its known at home) never even entered the conversation – or if it was, it was considered inferior to our own football only played by “foreigners”. My first exposure to the most popular game in the world came when I briefly attended a school in inner city Melbourne at the age of 9. My new school mates invited me to play some football at lunch time, but when I got there, I asked where the football was. It was a football, but not as I knew it. While I soon moved back to the country and never played the “new” football I had been introduced to again, the seeds had been planted. I had learnt that other games do exist. They weren't better or worse, just different. In the end I adopted another “foreign” sport, basketball as my game of choice. It wasn’t until the 1998 World Cup that I started to finally take notice of the game loved by billions in the world. Like much of Australia, I thought the Socceroos were a great chance of making it to the finals in France, with only Iran standing in our way. Unfortunately, it wasn't yet our time, with the lasting memory of Mark Bosnich being left on the ground as the equaliser went past him to leave Australia short after being so close. Moving to Melbourne in 1998 to go to university, I met a lot of people passionate about football and looking forward to the World Cup. It rubbed off on me. I watched a lot of matches during that World Cup and from that point on became a big fan of international football. That passion for the international game didn't translate into me becoming a fan of the local game however. The local league, the NSL, was in shambles with fighting and ethnic violence among the fans. It didn't encourage the new fan to get involved. When it was time for internationals though, I was back on board. Qualifying for the 2002 World Cup was once again seen as our chance to make it to the world stage, however like ’98, our boys fell at the last hurdle. It seemed the most talented generation of Socceroos since the 70’s was destined to never make the big time. Once the 2002 World Cup rolled around though, many forgot about the disappointments of our team and enjoyed an immensely entertaining tournament – for the first time ever in a time zone which gave us prime time viewing. The big games were even televised on a major commercial television station. It seemed that Australia was finally catching on to the world game. It wouldn't last. With the NSL still in strife, the major Australian codes quickly regained the ascendancy and football was relegated to a side note once again. This time, however, I continued to become more of a fan of the game itself, watching more European club football, and taking interest in the news that Australian club football was finally starting to talk about a makeover. In 2005 I finally packed up my bags and headed out to see some of the world. When Australia finally qualified – in a gripping penalty shootout – for the 2006 World Cup, I was working in an insurance office in England, getting text message updates from my friends. While my new colleagues thought I was crazy, I was ecstatic – they’d finally made it. By the time the 2006 World Cup rolled around I was living in Scotland. Being a backpacker, I had many other backpacker friends and as such, every game had some interest to somebody in our circle. So for a month we hit the local sports pubs watching game after game. I actually managed to get to a warm up game between South Korea and Ghana, and while nothing was on the line, it was great to be able to see the passionate fan bases of both teams come out and support their teams as they got ready for the big event. Australia’s first shot at the finals in 32 years was successful, despite the misery at the end. Tim Cahill sparked 3 goals in less than 10 minutes to come from behind against Japan, while a tense and sometimes spiteful 2-all draw against Croatia was enough to see us through the final 16 after a respectful loss to Brazil. While the final 16 match against Italy ended in bitter disappointment, Australia had announced itself on the world stage. While I loved watching the matches with people from all over the world in Edinburgh, almost as soon as the tournament started I realised something – I should have been there. I was a short flight (or a long bus ride) away, and could have done it quite easily, but I didn't – and to this day I still can't explain why. Since then the revamped local competition – now called the A-League – has gone from strength to strength. Melbourne now has a purpose built stadium for the world game (and rugby) and the Melbourne Victory has been one of the most successful sides in the new competition, both on and off the field. Finally, the game has started making inroads. The Australian team has evolved too, now part of the Asian federation, the team has a chance to play together more often, in more meaningful competitions, and has made it to another World Cup (2010 in South Africa) and been in an Asian Cup final since the switch. 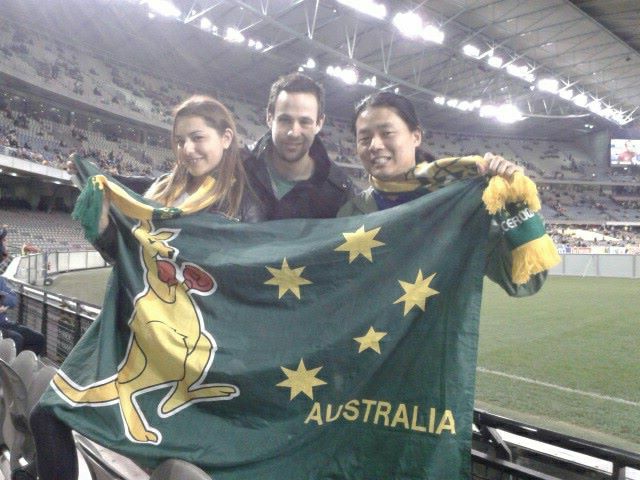 Early next year, Australia will host the Asian Cup finals, a move that will undoubtedly help turn casual fans – as I once was – into diehards. While nobody has any great expectations for this version of the Socceroos with the draw doing us absolutely no favours and our side very much in transition, the mere fact that 15000 Aussies are heading to Brazil for the World Cup is testament to how successful the game has been in finally made its way into Australia's national consciousness. When I'm in that stadium in Cuiaba watching our side walk out to play Chile, it will be the culmination of a long journey. Not only the last 10 months getting to Brazil, but from kid who didn't even know that the game existed to man who wouldn't be anywhere else.